The famous South Beach section of Miami Beach is a very confusing place that we don’t really fit into (except that we like the beach and Art Deco architecture). Full of glitzy clubs and cheesy tourist shops, it is definitely not our scene. However, there are some places that really do stand out in a positive way, including Under the Mango Tree. This tiny juice and snack bar (plus giftshop) is located In a nondescript row of shops just off South Beach. 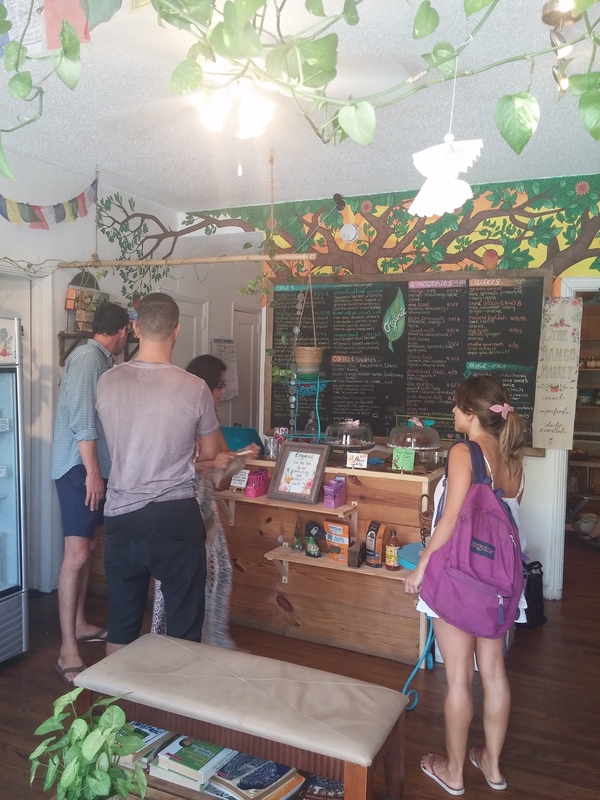 Under the Mango Tree (714 6th St. Miami Beach, FL) specializes in a wide range of natural juices and smoothies (mango, beet, carrot, kale and more) as well as açaí bowls and other healthy treats. Unique selections include a dragon fruit bowl, tumeric chai tea, an agave, almond milk and raw cacao smoothie as well as a kale melt for something savory. The inside of the store is cute and welcoming, with colorful walls, Tibetan prayer flags, plants everywhere and little wooden benches. At any given time all the seats may be full! Though there is a big selection, the açaí bowls are what really draw us in. Having sampled a fair number of açaí bowls outside of Brazil, we have to say this is our favorite. 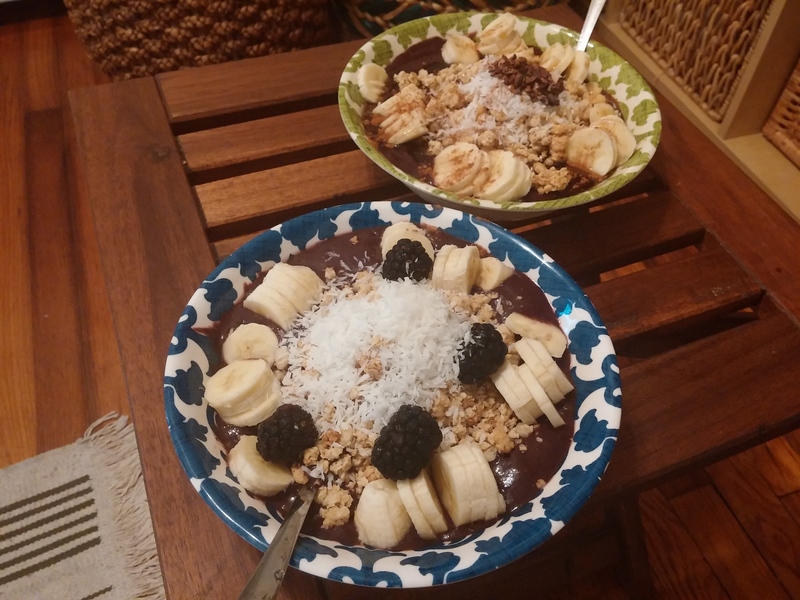 M always orders the chocolate açaí bowl with cacao powder ($9.5 for regular, $11.5 for large), shredded coconut, cacao, granola and banana slices. L goes for the classic açaí bowl ($8.5 for regular, $10.5 for large) topped with shredded coconut, granola, sliced bananas and blackberries. The açaí bowls are generous in size, and have the perfect creamy (not icy) consistency. They are also not too sweet, which is sometimes a danger. We can’t think of anything more delicious or refreshing after a day at the beach. In the back, there is even a little shop area that stocks unusual organic items as well as fresh produce. 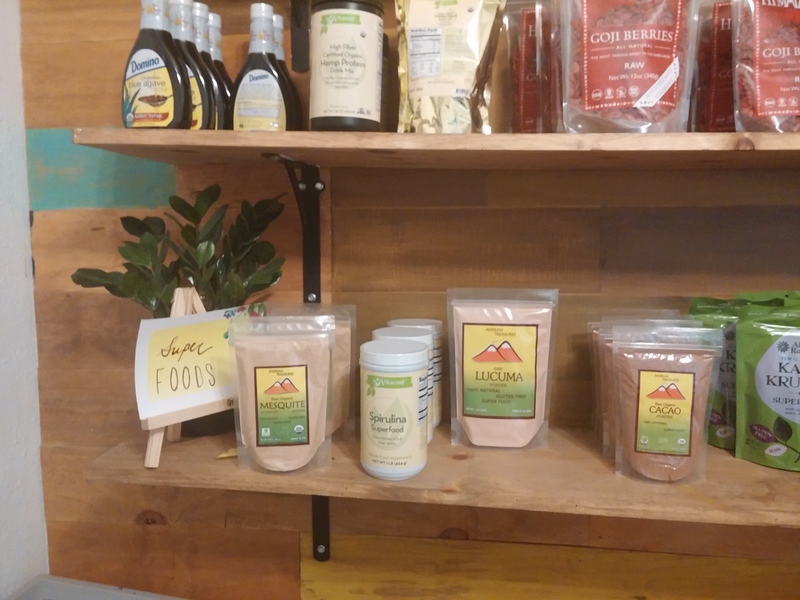 Along with the usual honey and granola we spotted something super rare – Lucuma powder! Matt became obsessed with Lucuma, a sweet and nutty Peruvian fruit, while he was studying there. Though it is used a common flavoring there, it is near impossible to get in the US. One of the people behind the counter at Under the Mango Tree is from Peru and she explained that the Lucuma was imported directly by a Miami woman who was from Peru. This was our find of the week, and we are currently plotting how to best incorporate Lucuma into every recipe. If you are looking to get away from the bustle on South Beach definitely stop into Under the Mango Tree for some juice – or even better – an açaí bowl.